Today's Prompt: Share your style. What fashion trends do you love, frequent, or avoid? I LOVE clothes. Of course, if you saw me in person, you might question that statement. I'm in (and have been in) a bit of a style rut. I work from home...which basically means yoga pants and t-shirts. I've also lost about 30 pounds (YAY!) so a lot of my clothes are too big (again, YAY). I seriously have about 4 "dress up" outfits for church or non yoga pant wearing activities. Ha. But, something has got to give. I desperately need to break down and get some new stuff. I'm a big fan of denim (especially distressed). I don't wear a lot of dresses. I struggle with finding ones I think are flattering. I do love a good maxi dress though. I think they always look cute paired with a denim jacket. I LOVE LOVE LOVE cowboy boots. I don't mind brighter colors but I tend to gravitate towards blacks, greys, navys, browns. I love lace. And leopard print. I also like lots of jewelry and big big bags. I don't know if I am a trend type of girl. I like the basics. They really never go out of style. I LOVE these looks...although not my true-to-self style. 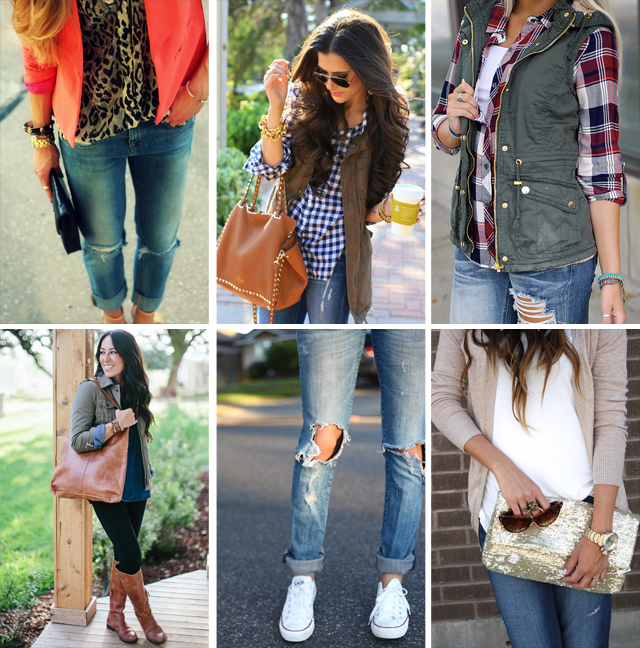 But I could see myself in the mountains, cozy-up by a fireplace reading a really great book in some of these outfits! That last outfit with the sparkly clutch... I'M SWOONING. So beautiful.